Super Smash Bros. director Masahiro Sakurai confirms that Ryu and Roy were not the last of the game's DLC fighters. If you're enjoying the steady stream of Super Smash Bros. DLC fighters that was kicked off with Mewtwo this year, well, the good news is that the train isn't quite at the station yet. 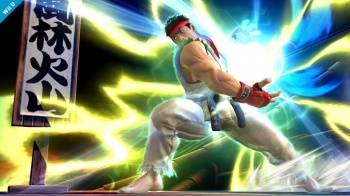 In an interview with Japanese magazine Famitsu, game director Masahiro Sakurai confirmed that Roy and Ryu were not the last DLC fighters, and that we can expect more to be added. For instance, remember that character ballot we saw back in April? Sakurai says that Ryu and Roy were already pretty far along in development at that time, which means that the "winners" of the ballot are still yet to come. In fact, Sakurai said that DLC characters would continue to be added to the game until his team can no longer be kept together, stating that "there's only going to be several more characters." "I also ask for your patience, as we need time to develop more content," he said. Keep on dreaming, there are only 2 on that list that are in the realm of possibility, the rest are varying degrees of "nope". But hey, the creepy squid kid is a safe bet, so you'll most likely get atleast one of your picks. I could see Simon happening though, Nintendo seems to be keen on bringing in 3rd party nostalgia baits with this one. That is of course if Konami doesn't wish to bury that entire series below sea level and pretend it only exists in pachinko. Still so much hype over Smash Bros characters. Give it a rest already, it's not as if Nintendo is releasing any single-player content to make actually playing solo worth a damn. Between Smash 4 and most of the games they had shown at E3, it seems like Nintendo doesn't understand the fact that not absolutely everyone wants to deal with other people while playing a game. Skorpion from Mkortal Kombat. Fatalities and all. the interesting thing to me is that if bayonetta were to be in smash she would kinda have to be dlc in order to not cause some amount of parental outrage. think about it, if it's a optional add on the helicopter parents can't really come attacking nintendo now can they. Phoenix Wright and Professor Layton need to be announced together. It would be so fitting. Scoprion? Can't see him happen. Sub-Zero (the younger one) on the other hand? That might work. If we remove his fatalities, his fighting style should be rather "family friendly", making him a surprisingly decent choice for Smash Bros on paper. Yet no sign of adding Pyramid Head from silent hill 2. Oh well, what konami do, eh? They should release the final DLC character of Satoru Iwata. I think that act alone would be a console purchase for me. But then the realisation that they could probably never be able to add Sony's president and Phil goddamn Spencer (who is no president but his name might as well be carved into every xbox owner's head) would dawn. We could never have that. The gods will not allow such things. So which characters get asked for the most again? -We already know Ridley is a no because he's a stage boss and they didn't want to downsize him to be a fighter. But the whole joke hinges on the hyperviolence of MK, which is why I chose Scorpion in the first place. Federation Trooper from the new highly anticipated Metroid title! He/she would be a great addition right? I'd still welcome it to be honest, new Metroid character in Smash would be cool. But I don't this one would get it. In all seriousness, I'd like to see Rundas from Metroid Prime 3 (he's the one I went for on the ballot) as it would add another Metroid character and his ice abilities could be quite unique. All of them are pretty possible; the hardest would be Bayonetta or Simon Belmont, but the others are all completely possible. Its even been rumored by some leaked and translated tweets from the developers that there is already a working model and concept for Shantae to come to S4. There's hope for Isaac, then? They could make Felix and Matthew his alternate costumes. Oh well, what konami do, eh? ...Who could also be considered the de facto mascot for a developer, as is fitting of a "Mascot Brawler..."
...And also fits the cartoon aesthetic of Smash. Maybe the fact that they've had a game on almost literally every Nintendo console couldn't hurt either. Hooray, more chances for Marth clones. Seriously, with Roy's inclusion we're up to about five. Hell the four on the primary roster was too many. I get that Fire Emblem's a big deal, but at what point do you realize enough identical-playing characters is enough? And I know there's about six characters from Pokemon, five from the Mario Bros. games, etc., but here's the thing. With the exception of Mario and Luigi (and even then, there's enough difference between them to be different) and Baby Bowser and the Koopa Kids (who are all skins of each other), none of the characters from those games play similarly. I still say if you needed a character from a first-party Nintendo IP it should have been Imajin (from Doki Doki Panic), Wonder Red (The Wonderful 101) or even Balloon Man (from Balloon Fight). Hell, even Ryu I get since Street Fighter II was a big deal on the Super Nintendo, though I would have preferred Shantae. Roy just made no sense to me, at least right now. Wait for a few more character DLC packs, get some more interesting, out-there or obscure characters, then bring in the fan-I-hesitate-to-say-favorite Roy. In fact, that's what I would have done. Next pack, "the fan-favorite pack", Roy and Solid Snake (provided they can get him, because I know a lot of fans have been clamoring to get him back and Konami these days is...well, Konami these days). But... Nintendo featured over 20 games (more than 2/3rds of the games they featured at E3) that focus primarily on single player, and even some of the primarily multiplayer games have a robust single player option. 2/3rds of all games is not enough? Seriously, with Roy's inclusion we're up to about five. Hell the four on the primary roster was too many. There was one Marth clone in the base game and she was like that because her original character was based around her pretending to be Marth. I know there's not a snowball's chance in hell, but it would be so awesome. If for no other reason than paying tribute to what was probably the most memorable third party IP on last generation's Nintendo consoles. I wish Lucina had been less of a Marth clone. She's one of my favourite characters (And the only Amiibo I've got), so her being Female!Marth rather than unique is annoying. But I also get the logic, which makes it more annoying. I think The Great JT sees Ike and Robin as Marth clones too. Somehow. With Ike's patented Boomsmash-explosion-doom and Robin's frankly embarrassing swordplay coupled with seriously bitching magic. I haven't given Roy a whirl yet. Is he actually a Marth clone, or an Ike clone like he was in Melee? He's basically an Ike-Marth hybrid, much like Melee. He's got his own style though.